Climate zones 8 and 9 drop to winter temperatures between 10 and 30 degrees Farenheit. Thornless blackberries are hardy to these zones and can be grown easily in a home garden. There are many varieties of blackberries specifically cultivated as thornless. Thornless varieties are easier to care for and harvest, and produce high-quality fruit. Zone 8 and 9 of the USDA Hardiness zone map include cities such as Austin, Texas, and Gainesville, Florida. Zone 8 average annual minimum temperature is 10 to 20 degrees F; zone 9 is 20 to 30 degrees F. There are two aspects to consider about climate zones when you plant a thornless blackberry. One is the macroclimate zone and the other is the specific conditions of the garden, the microclimate. Take into consideration the soil, slope, wind,and water in your microclimate. Thornless blackberry plants are part of the family of plants called Rosaceae, or Rose. It is a bush-like perennial plant with branches called canes that grow to 33 feet. The berries bloom in clusters from spring to fall, depending on the variety. The ‘Arapho’ variety of thornless plant can bloom as early as March in Zone 9. The leaves on all varieties are three on a stem with slightly serrated edges. There are several popular thornless blackberry cultivars that grow well in climate zones 8 and 9. The ‘Arapaho’ berry was developed at the University of Arkansas where it was noticed that the berry is almost seedless as well as thornless. 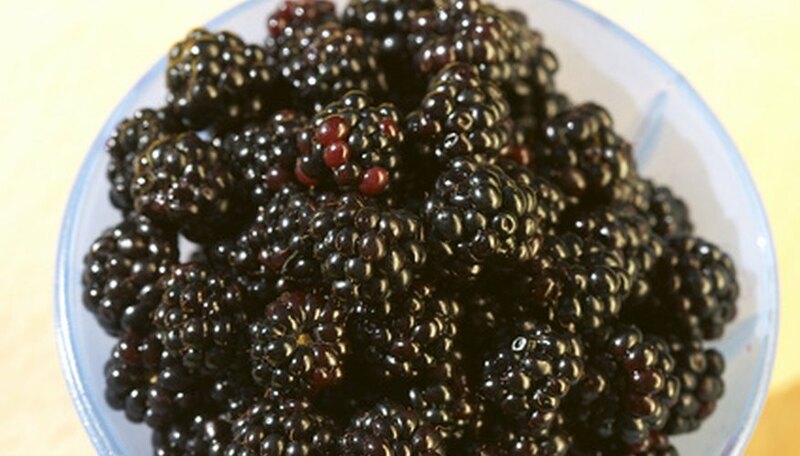 ‘Black Satin’ berries are large and firm and nearly black in color. The canes grow semi-erect but need support when full of berries. ‘Doyle’s thornless Blackberry’ produces 10 to 20 gallons of berries per plant. Thornless blackberries make harvesting much more convenient and painless. Thornless cultivars also produce plumper, higher quality fruit. In climate zones 8 and 9 the berries begin ripening in June and July. Blackberries produce fruit on second year canes and need to be trained onto wire supports or trellis. Thornless plants are easier to train and to prune. All blackberry types need pruning and training. There are erect, semi-erect and trailing varieties of thornless blackberries. In Zones 8 and 9 the best time for first pruning is in the fall when berry harvest is complete. Cut away all the canes that have just produced fruit. In early spring cut canes back to five to seven per plant. Prune these canes to 12 inches or 12 buds. Thornless blackberries are a good choice for home gardens in zones 8 and 9. Blackberries are easy to grow, very disease resistant and a healthy food that is high in antioxidants. Blackberries are easy to train onto a wall trellis and can also be grown in a container.